Muhammad Ali still "The Greatest"
I have written numerous articles on Muhammad Ali and although I am known for being wordy, there's really no new way of saying that Muhammad Ali is the greatest of all time. This past Sunday, the Louisville native who changed the sport of boxing -- and frankly the world -- turned 68 years old. Since his rise to boxing stardom in the late 1950’s and early 60’s, Ali’s words and fights have caught the attention of young and old, black and white, boxing and non-boxing fans, plus everybody in between. I have written many piecesabout Muhammad Ali and his life, but this time I will simply offer one of the many example of Ali’s greatness. October 30, 1974, Kinshasa, Zaire. The date and location of one of the most intriguing boxing upsets in history. Ali was nearly 33. The boxer in the opposite corner was a 25-year-old George Foreman. Foreman’s nickname was “Big” simply because he was. A big fighter with big power, and a big threat who had big potential. The nearly 6-foot-4 220-pound Foreman had been walking through all foes, including the lone man who had beaten Ali at the time, Joe Frazier. The bell rang for their contest and instead of using his boxing skills of jabbing and his impressive speed, Ali utilized what many considered the worst-possible tactic a fighter could use against Big George. He stayed on the ropes. While his corner implored him to get off the ropes, Ali continued his strategy. Eventually however his fans and his corner saw what Ali saw all along: Ali had figured out how to beat Foreman. Foreman had devastating power, but you can’t hurt what you can’t hit, and Ali made George miss as much as possible. Big George was also quite slow and lacked quality stamina. Ali utilized what is now known as the “rope-a-dope,” lying against the unusually loose ropes, then making Foreman pay whenever he missed. Ali waited for the precise moment to counter, and he did in the eighth round with a right hand that sent Foreman to the ropes. As George bounced off the ropes Ali landed a left-right combo that sent George down. Ten seconds later, the fight was over and Ali raised his hands in triumph displaying what he knew all along. He was the greatest. 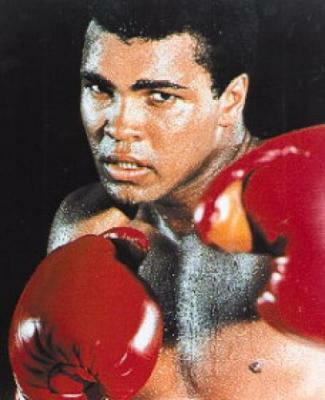 Over his career Ali had many moments which defined his greatness. His mouth always had him in trouble, however his fists always bailed him out. Other fighters since then have had their great moments as well. Ray Leonard’s wins over Hagler and Hearns for example, or the reign of Mike Tyson. The difference is that Ali had all sorts of great moments and is the example of greatness. I can’t say it any other way. The greatest of all time, Muhammad Ali is still the greatest.